Fits for most of 42-70" LCD/LED/Plasma TVs in 132 LBS, with max VESA of 600x400mm/24" x 16" (from 200x200, 300x200, 300x300, 400x200, 400x300, 400x400, 500x300, 600x200, to 600x400mm). Please check VESA (mounting holes pattern), studs spacing, possible blocked cable/input and TV weight to ensure compatibility. One-piece long wall plate: fits for solid concrete wall/wood stud spacing of 16"and 24", Caution:This mount is NOT for dry wall alone installatoin! easy centering with this long wall plate, and with paper template for easy installation. 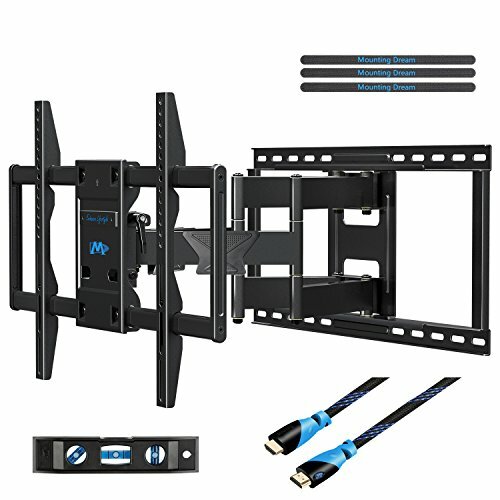 Smart TV hanging design: brackets attached with TV hang onto wall plate easily, two tube clips lock brackets with TV onto wall plate in safe manner. Supreme arms: holds TV up to 132 LBS with 18.5" extension and 2.7" depth to wall, adopting automatic robot welding technology for smooth and stable movements. Cable clips on arms offer cable management for neat look. Full motion: +5°/-15° Tilt, +/-45° Swivel and +/-3° rotation for maximum viewing flexibility. Dual spring-loaded handles design for easy tilting angle adjustment. All hardware, 6' HDMI cable, mounting template, bubble level included. Finish of the mount and all hardware is RoHS (Restriction of Hazardous Substance) certified.